A Church amongst the Hills, by Mike Jackobo. The sun can barely reach a church amongst the hills. 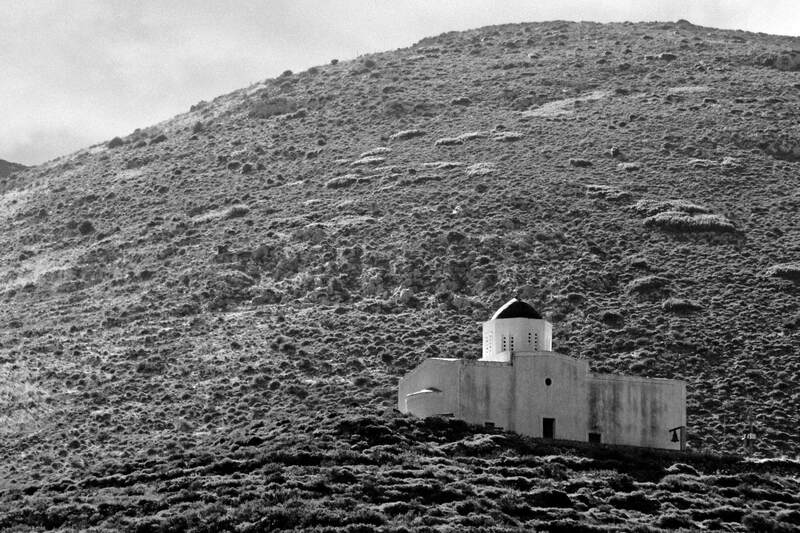 The location of the church is above Porto Kagio, in Mani. Although it seems that I made this photo in the morning, I actually took at noon. More on that later. One of the fun things about photography, is the unpredictability. Sure, an experienced photographer knows how a photo would be like before he even raises the camera. What I am mostly referring to, is when one makes a good photograph where he doesn’t expect it. In this specific case, I am talking about travel photography. I was driving around Mani, visiting locations I knew beforehand and exploring new places. Porto Kagio is one of the well-known places in Mani. It is situated in a small bay, to the east of the peninsula and there are quite a few sightseeing spots around it. Although it is a good location to explore, on one hand I was a bit too tired and on the other hand the strong winds made hiking on the rocks somewhat risky. Mani had a notorious reputation because of the rocky coastline and the relentless strong winds. Therefore, the visit to Porto Kagio was unproductive. And then the unpredictability factor became involved. I saw the church of Agia Triada as I was approaching the village. As I was driving away from it though I saw it under a different light; literally. The way the rays of the sun were hitting the building was every photographer’s dream. And the way it stood out amongst the hills, made for a perfect photo. I just couldn’t pass it by. I wrote at the beginning of the article that I made the photo at noon. Yet, we associate this quality of light with morning photos. That is because of the location of the sun on the sky and the angle from which its rays hit the objects. In January, the sun is very low above the horizon. So, even at noon, its light reach the earth at a low angle, similar to summer mornings. Many photogs have heard that you shouldn’t take photos at noon (Ha-Ha-Ha) but they don’t know about the angle of the sun as the seasons change. So, they follow this “rule” by heart and they miss on a lot of chances to make great photos.